The Boosterthon Fun Run was Friday and everyone had a blast!! It was a beautiful but cool day for the students to run their laps and they all completed at least 30 laps. Thanks so much to the Boosterthon team, the parents, CHES staff and everyone who came out to help and cheer our students on as they ran the Fun Run. 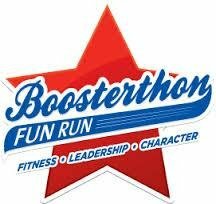 After all the totals came in on Monday, the Boosterthon teamed announced we had pledged $14,300 towards our goal of $18,000!!! We had pledges from 29 states. The top classes for each grade are listed below. It’s now time to collect your pledges and get them turned in to your child’s teacher. by Friday, Nov. 9th. Please contact each of your sponsors and collect their pledge. They may pay by cash or check to you or they may pay by credit card online. Information concerning the collection of the pledges was sent home with your child earlier this week. Please be sure to read the information and place your collected money in the collection envelope to turn in to your child’s teacher. Thank you again for your support of CHES!! !